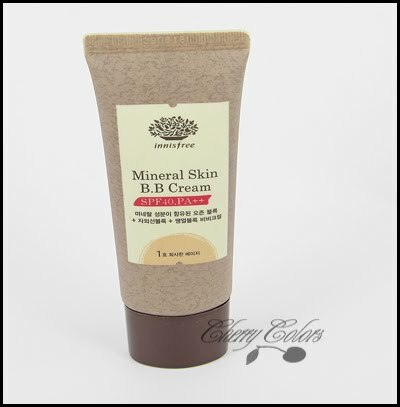 Review: Innisfree Mineral Skin BB Cream - Cherry Colors - Cosmetics Heaven! I got this BB cream in a swap and I must say that I love it. At first, I thought that it gives too much coverage, but I learned how to work with it. It comes in a 40 ml tube, but I had it for a couple of months and there's still 1/3 left even if I used it daily. It has SPF 40, which is a great thing. I also read that it contains natural ingredients, but I can't check that anywhere because it's written in Korean. It costs about $20 on Ebay, which is a bit pricier than the other BB creams I tried. This is the amount that could cover two faces (or give you some serious coverage). I got distracted and didn't realize that I squeezed too much out of the tube. I really like it, in terms of coverage. At the time I got it, I didn't need it, but now that my skin is well messed up, it comes handy! It looks really natural, and it's the perfect shade for me. I think that this is one of the best BB creams I've ever had. I'd love it even more if I didn't have to blot my face every 5 hours or so. Tho with a good setting powder the problem is easily fixed. Overall: I do like it a lot. It has great coverage, some oil control (I have combination skin with an oily T-zone) and it's the perfect match for my skin tone. The scent it good, especially for me because I hate perfumed scents in BB creams. I think this is one of those rare BB creams that have absolutely good coverage. The texture is creamy, tho on the thicker side, so I apply mine with a stippling brush for a more natural result. I think I will buy it again, when I run out of it because honestly, it's good!